Hughes JM, Freiermuth C, Williams JW Jr, Ragsdale L, Eucker S, Goldstein K, Rodriguez R, Fulton J, Hastings N, Shepherd-Banigan M, Ramos K, Alishahi Tabriz A, Gordon AM, Gierisch JM, Kosinski A, McDuffie J, Van Noord M. Emergency Department Strategies for Older Adults. VA ESP Project #09-009; 2018. Older adults, particularly those 75 years of age and older, visit the emergency department (ED) with nearly twice the frequency of their younger counterparts. Within VA, older Veterans account for 40 percent of 2.4 million annual ED visits. This figure will continue to rise as the number of older Veterans is expected to increase significantly over the next decade. Older adults presenting to the ED can experience challenges that make care more difficult, such as multiple morbidities, polypharmacy, atypical symptoms, functional disabilities, impaired cognition, and reduced social support. To address these challenges, a range of interventions designed to improve clinical outcomes and decrease healthcare utilization in older adult ED users have been evaluated in prior studies. These include care delivery, case management, and transitional care or discharge planning. Systems-level attention to these challenges is also evident through the 2014 publication of the Geriatric Emergency Department Guidelines (hereafter referred to as the 2014 Geriatric ED Guidelines). These collaborative guidelines provide a template for staffing, equipment, education, policies and procedures, follow-up care, and performance-improvement measures, but do not include evidence-based recommendations on specific ED interventions. Our review aims to fill gaps in the literature by synthesizing evidence about ED interventions for clinical outcomes such as functional status and quality of life and utilization outcomes including hospital admission and ED readmission. Additionally, our review carefully classifies individual intervention components and uses rigorous analytic techniques to compare the effectiveness of selected interventions on outcomes of interest. 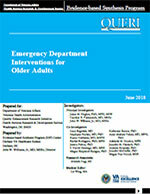 How effective are emergency department (ED) interventions in improving clinical, patient experience, and utilization outcomes in older adults (age =65)?